There's not much to say about this one. The Gray Ghost is a classic New England streamer we all know and love. This rendition liberally substitutes both natural and synthetic materials. 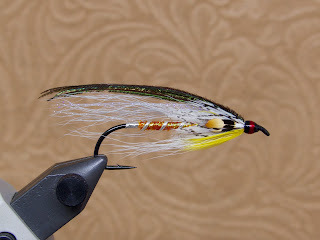 The way I figure, if you're going to tie a big streamer, it might as well be flashy. Yesterday morning, I checked the Connecticut River Salmon Association's website like I do from time to time. They are a great organization and I high recommend browsing their site and learning about all the great work they do. Anyhow, I noticed a headline about how the Kensington hatchery has made it back into the state's budget. 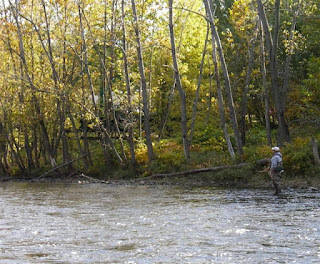 There is more information about the recent legislative session on the CT River Alliance's website. This is great news! Thank you to all who wrote letters, emails and made phone calls on behalf of the Kensington hatchery, its staff and its trout and salmon. It looks like we'll have another salmon season in Connecticut in 2015. Start tying flies now. Fall will be here before you know it! The Gray Ghost variant looks good. I'm glad you chose to use the JC...makes a big difference to both the eye of the angler and the fish. If that were in my wallet, it would be the first and probably only fly I'd use all day! Perfectly sparse and so well tied! Screams confidence! Glad to hear you'll have another river to chase salar in! Will have to come see you! Thanks! I actually based this GG on one of yours I saw, but with a couple tweaks. But, mostly your fly. Whenever you want to come I'd be happy to give you the grand tour, bro!